These are hands-down, the BEST veggie burgers I have ever had. The only thing I did different was use Knorr vegetable stock powder with a cup of boiling water for the stock, instead of an actual vegetable stock… because it was readily available, and I’m partial to the flavour of the Knorr powder. For anyone concerned about the simmering part making the burgers soggy… I had the same concern too, as did one friend of mine who thought the simmering step was odd. I’d have to agree with everyone else who said to brown them first and make sure they’re cooked… but also remember that the ingredients in this are very dry, save for the milk and eggs. The burgers won’t produce their own juices like real meat would, so they will soak up all the juice if you leave the lid off and that will keep them moist. If you’re using a big enough pan/skillet, they’ll only be sitting in .5″ of water anyway. Thank you, very useful. I wasnt actually a big fan of Spinach for many years ( understatement, I hated the stuff), but after marrying a vegetarian I kind of had to get used to it, and have gradually come to love the stuff. Spinach curry is now my absolute favouritest! I even found an entire spinach recipes website which is my new favourite site now, you should have a look! Has anyone tried to grill or barbecue these? If so, did you follow all the steps and then grill or change the steps slightly? How did they turn out? These look awesome, but really want a veg burger that does well on BBQ. This is hands down the best recipe I’ve come across for veggie burgers. For those of you looking for egg substitutes, tapioca flour and some water works great in most recipes. I added chopped mushrooms and old bay seasoning. YUM. This has become my replacement ground beef in every recipe. It has the same color and texture as ground beef when it’s all done. Super site! Your writing is so refreshing compared to most other bloggers. Thank you for writing when you do, I’ll be sure to subscribe! Stephanie, um, no, nutritional yeast would not replace eggs. I suggest you google egg replacers. Nutritional yeast is a flavoring agent. So is there a recipe for the best veggie meatloaf ever? I’m on a quest.. I’ve made many, not a big fan of lentil based ones, or tofu. I know I really like oats, nuts, and sage. Any suggestions? 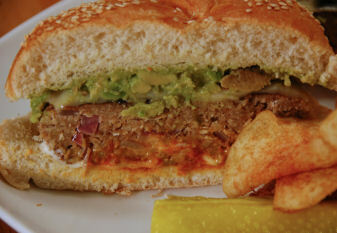 I was looking for a veggie burger recipe I tried before and stumbled across this one. I just finished making them. Tastes just as good as the one I had last night from the fast food restaurant but much cheaper. I lovvvve it! I’m going to use it in place of my old meatloaf recipe with carrots, potatoes, and green beans. This is definitely a keeper. Would nuritional yeast replace the eggs? Only thing is, geek, I can’t eat fried food: I was up all night saying OWIE and holding my tummy. Has anyone tried baking them? I would just sautee, but I think they will fall apart! I became a Vegan 3 months ago and I feel really great! Thanks for the useful recipes – will defenitely give ’em a try soon. These are very good. Even my very picky (vegetarian) husband liked them. The look & feel of these are very similar to hamburgers. I halved the recipe because I wasn’t sure how quickly I’d use the rest of the mixture and I was unsure of how long the mixture would keep. Like other readers, I was skeptical of the steaming step. My burgers did not fall apart at all, but at the end of this step, they were soggy and moist. Maybe that’s how hamburgers are (I don’t recall), but I refried them so they’d be crispy again. I used one can of vegetable stock for four burgers in a very large skillet, so the burgers were half covered with broth. I don’t know if that was right. I used instant oatmeal, purchased in the bulk food section by mistake, and it worked just fine. My mixture was refrigerated for 4-5 hours which was also fine. Thanks for the recipe! I’ll be making it in the future. lisa: I’m not saying you can’t but I haven’t tried. I’m sure you could here but it may affect the texture of the burger a little bit. Give it a shot and let me know? i was wondering can you substitute cooked brown rice for the oats? Thanks. Yes they have milk and eggs but I never said they were vegetarian/vegan burgers. If you need them to go the vegan route, the milk can be replaced with water and the eggs could be replaced with silken tofu. A previous commenter tried using flax/water to replace the eggs but had some issues with the burgers staying together. Hi! I was just wondering if after these are simmered in broth, if they freeze well? I am the only non-meat eater in my family and I would like to have something to bring when we go to bbq’s. Thanks! The oatmeal goes in dry. No cooking required. It gets cooked nicely when the burgers are fried up and cooked in the broth. Using 4 eggs and 2 cups of walnuts, with 10 patties made, prior to cooking each will have 340 calories, 20g total fat, 2.5g Saturated fat, 300mg sodium, 300mg potassium, 30g carbs, 13g protein, 5.5g fiber. The sodium of course can be cut just by using less salt (I calculated with the 1 tsp in the recipe) but if you use a high sodium broth for cooking the patties in, that will go way up. The oats are added dry. Do you cook the oatmeal first or add it dry? I’ve found that I don’t need to steam them, or do anything with the vegetable stock. I simply fry them straight out of the fridge, and they taste great. Don’t see the need for the steaming. Also, for burgers falling apart: keeping them in the fridge for an hour or more really solidifies the mixture. Usually 2 eggs suffice, or even 1 egg and a few egg whites. Never had a problem. Man, these burgers are a hit! We’ll be revisiting these real soon with a section on grilling these up for the summer. I made these for a Memorial day gathering. They were a hit among vegetarians and meat eaters alike. I grilled them after they had simmered and they turned out really good. They didn’t crumble on the grill. I’m definitely giving this recipe to my friends. VeggieKeely, sounds like you need a stronger binding agent than your flax/water mixture. Silken Tofu is one possibility. Other thoughts are arrowroot starch or agar. Let us know when you find something that works. 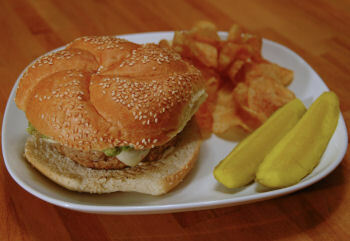 The flavors of this veggie burger are fantastic! However, I cannot get the consistency right for some reason. I’ve never been more determined to perfect a recipe in my life! I know that they will be phenominal if I do! They’ve been falling apart in the simmering liquid. I’m vegan so I use a flax/water mixture in place of the eggs. That’s the only alteration that I’ve made. You should have no problems frying them up after they’ve steamed up in the liquid. I actually fried a bunch of the extra mixture off into meatballs the following night and there were no problems at all. You could probably even grill them after they’ve steamed up, too! I would imagine that since the burgers bind quite well together, they’d hold up to frying afterwards. I’ll ask the foodie to interject his opinion on the matter, though, since I’m definitely not the expert! I tried these today, halving the recipe since I only had 2 eggs. they were really good BUT I have a question: when I’ve had walnut burgers in veggie restaraunts, they’re always fried crisp. These were a bit on the soggy side, which isn’t surprising since they steam in a liquid. But does anybody know (before I experiment and ruin a batch!) can you just refry them after they’re steamed…and is that how they become crisp? Or is that a different recipe altogether. I have not yet tried the veggie burgers, put plan on making them in a day or two. What I was wondering, is there any breakdown of the calories, fat grams, etc? This would be really helpful. Thanks!! I gotta try this recipe, everyone seems to like it. My fiancee and I eat veggie burgers every now and then. We eat them on english muffins which we toast first and then we add tomato, lettuce and taco sauce. Try the taco sauce (or salsa) – it really works! These are very, VERY good, I was skeptical but no more, amazing! This is the first time I’ve made veggie burgers from scratch and I absolutely LOVED them! Sooo much better than the frozen ones. I served them with sauteed mushrooms on whole wheat buns, and my hubby and housemate both really liked them too! I can’t wait to make them again! I made these years ago and noted in the cookbook that they felt apart when simmered. Tried it again and same thing. I used 1/4 flax/water mix to substitute for egg and soymilk in place of milk. Used lesser amount of walnuts and more like 1/2 tsp salt. Instead of frying and simmering, I made patties and put them on a greased metal tray with holes and steamed them in the pressure cooker for 10 minutes. Works great–very firm. If you don’t have a pressure cooker, you could just steam them a bit longer in a regular pot. Do you also place the other ingredients in the blender along with the Walnuts or do you add the chopped Walnuts to the un-chopped Oats, eggs, etc. and mix accordingly? When I made my burgers, I only chopped the walnuts and added to the other ingredients then followed the rest of the recipe. Made one of the best Veg Burgers I’ve ever had. Note: These would even be good without the Burger condiments and bun. These burgers are so good. I’ve made them 3 times now. The last time, I added a heaping Tablespoon of nutritional yeast for a cheezy flavor, and I replaced 2 Tablespoons of the milk with soy sauce, and I eliminated the salt. They were even better than the first 2 times. I’m making these again and again! The amount of nuts added is a personal decision. Less nuts, less crunch, more nuts, more crunch. I think I settled for somewhere in the middle, around two cups of nuts. lovely recipes, I will be back to visit you. As long as you get them good and browned on both sides BEFORE you add the water, everything works out fine. Really, these things were quite dense, there was no real fear of them falling apart. I did the same thing for the meatballs, too, and they came out just fine. I think the recipe is quite foolproof. Jef did do the boiling part of the recipe. The texture of the mixture is quite thick and includes eggs as a binder, so once the burgers were browned, they held together just fine to the simmering. I hope you find them as yummy as I did! Did you do the boiling thing with the stock in the skillet? It sounds to me like something that would give me a load of porridge at the end unless I read the recipe wrong, or did they stay intact? I’d love to give them a go, they look yummy!